Max. Scan Width: 24" / Document Size 26"
Create stunning prints and make high resolution scans with the imagePROGRAF TM-200 24" Large-Format Inkjet Printer with L24ei Scanner from Canon. Able to print media up to 24" wide and with a maximum resolution of 2400 x 1200 dpi, users can create high-quality documents and graphics with sharp text at large-format sizes. Featuring a high-precision, high-density printhead, with a total of 15,360 nozzles, the printer lays down 5 picoliter-size droplets that produce sharp lines and fine details for exceptional image quality. 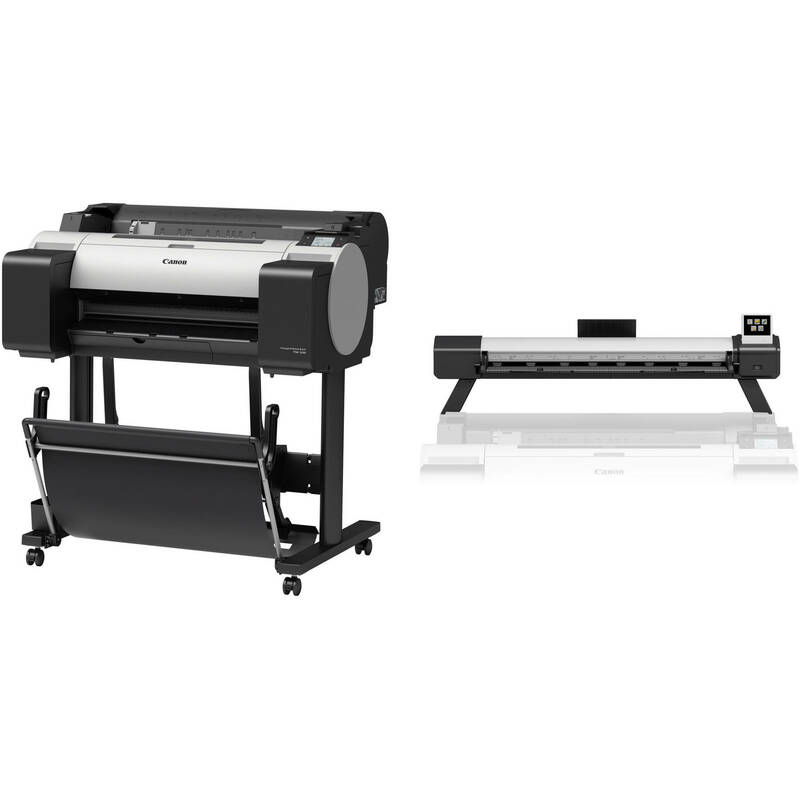 Along with these printing capabilities, this multi-function unit offers high-quality scanning of large-format documents at an optical resolution of 600 dpi. Able to accept documents up to 26" wide, the L24ei has a scan width of 24" and can scan media as long as 109." Utilizing Canon's 5-Color LUCIA Inks, the TM-200 is ideal for technical documents, CAD drawings, GIS maps, posters, signs, and displays, and the UV and water-resistant inks add a level of protection that can withstand many outdoor conditions, making the printer well-suited for creating and taking building plans onto construction sites. This also makes the printer an excellent option for posters, signs, and displays. For operating the printer, a 3" color touchscreen is featured, and a dedicated USB port permits printing directly from a thumb drive. The printer has wired and wireless networking via Ethernet, and Wi-Fi connectivity, and it has USB 2.0 for simple connection to a computer. Additionally, the unit's Sub-Ink Tank System allows most of the available ink to be used before replacement, which eliminates wasted ink and saves on operating costs. The high-density, 6-channel PF-06 printhead has a maximum resolution of 2400 x 1200 dpi and is designed for fast printing with minimal mist spray. It has 15,360 nozzles and lays down 5 picoliter-size ink droplets, allowing the printer to produce clean lines and text resulting in sharp detail and excellent image quality. Featuring a 5-Color LUCIA ink set, this UV and water resistant ink is formulated to produce fine lines and sharp text on both inkjet and non-inkjet paper. Combine these inks with water resistant media and you have printed documents that can withstand many outdoor conditions, especially outdoor job sites such as construction sites. Additionally, this makes the printer well-suited for creating outdoor poster displays and store signs. The Sub-Ink Tank System allows virtually all of the available ink in a tank to be used before having to replace it, helping to eliminate wasted ink and cutting down on consumable costs. The empty tanks can also be replaced without stopping the printer, which is useful during long print jobs. Featuring a 3" color touchscreen operation panel, the TM-200 makes it easy to view printer information as well as perform simple operations. With Wi-Fi connectivity, you can transfer technical drawing files and speed up workflow. No Wi-Fi router is needed providing greater freedom during installation. An accessible USB port permits the use of a thumb drive for direct printing of files without the use of a computer.